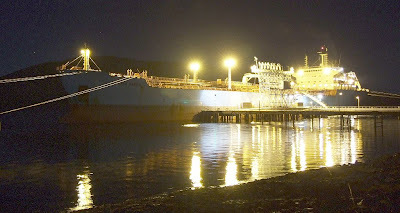 The tanker MAERSK RAPIER, which is currently on charter to the Ministry of Defence, called at Loch Striven NATO jetty yesterday, where she was seen last night. Owned by The Maersk Co Ltd, she flies the British flag and is registered at London. A versatile ship, she can carry up to five different grades of cargo at any one time. She is 34,985 tonnes deadweight, and has a gross tonnage of 22,181 tons. She was built, like so many tankers nowadays, in China, and came from the Guangzhou shipyard in 2000. She is 171.2 metres in length, and has a MAN B&W 5-cylinder main engine which gives her a service speed of 14.5 knots. She sailed this afternoon for Gosport.